William (Wimpy) Winpisinger (1924-1997) was, at the time of his death, Democratic Socialists of America National Vice-Chairand a retired President of the International Association of Machinists and Aerospace Workers (IAM). In addition to his positions with DSA and the IAM, Winpisinger served as a member of the AFL-CIO Executive Council; a member of the Finance Committee of the Democratic National Committee; co-chair of the Collective Bargaining and Group Relations Institute; a trustee of the National Planning Association; President of the Citizen/ Labor Energy Coalition; a member of the Board of Governors of the National Space Institute; a board member of the Americans for Democratic Action; a member of the Executive Committee of the International Metalworkers Federation; and an Executive Board member of International Guiding Eyes. Winpisinger began his career as an automobile mechanic, learning the trade in the Navy during World War II. He started his IAM membership in IAM Automotive Lodge 1363 and rose from shop steward to local lodge president. In 1951,he became one of the youngest members ever appointed to the IAM's national field staff. In 1977 Winpisinger was elected President of the IAM. He gained a reputation for bluntness by calling for George Meany, the then President of the AFL-CIO, to retire, because, at 83, Winpisinger considered Meany too old conservative to lead a young workforce. Winpisinger also served as a member of the Executive Committee of the International Metalworkers Federation. According to the December 29, 1979, issue of Information Digest, the "initiators" of the Democratic Socialist Organizing Committee (forerunner of Democratic Socialists of America) , formed in 1973 as a result of a split within the Socialist Party USA, largely over the issue of cooperation with communists, included Julian Bond, Heather Booth, John Conyers, Ronald Dellums, Douglas Fraser, Joyce Miller, William Winpisinger, and Jerry Wurf. Winpisinger was also Co-Chair of the Democratic Socialist Organizing Committee (DSOC). Circa early 1980s, William Winpisinger was an endorser of a US-Soviet Nuclear Weapons Freeze petition circulated by the Nuclear Weapons Freeze Campaign, National Clearinghouse, based in St. Louis, Missouri. Keynote speaker William Winpisinger concluded the evening with a hotly partisan attack on President Carter,asserting, "If Carter is nominated (in 1980 there won't be a Democratic Party in 1984. Winpislnger who had endorsed Senator Edward Kennedy for the presidential nomination, charged, "Carter is a small-town hypocritical aristocrat who behind the facade of bumbling good intentions has the rigid mind of a nuclear engineer and the heart a a corporate executive. " White House plans to increase U. S. defense spending were bitterly denounced, as was the MX missile, "a monument to technological folly." In 1980, Winpisinger led a walkout of some 300 delegates from the Democratic Party Convention to protest the Convention's nomination of Jimmy Carter for President. The electronic media ignored the walkout, and Carter operatives blocked the aisles, pushing protesting delegates into seats. Earlier at the 1980 Democratic Convention, Winpisinger had addressed a Socialist Caucus organized by the Democratic Socialist Organizing Committee. Some 100 people, including 40 delegates, came to their feet, as Winpisinger concluded the caucus. Someone shouted, "Wimpy for President". Winpisinger replied, "I'm president of the only thing I want to be president of right now. By the time I learn this job, I'll be ready to retire, and that's it altogether." Winpisinger worked "for a sane nuclear policy for all people in advocating the conversion of arms production to peaceful purposes" and was a founder and president of the Citizen / Labor Energy Coalition. Winpisinger had a connection to the Soviet front World Peace Council. The first official World Peace Council conferencein the U.S. was the Dialogue on Disarmament and Detente held January 25-27, 1978, in Washington, DC. It was sponsored by a small committee including and World Peace Council Presidium member Communist Party USA functionary and Amalgamated Meatcutters Union vice-president Abe Feinglass. Attendees included Katherine Camp, International President of the Women's International League for Peace & Freedom, Rep. Ron Dellums, International Association of Machinists and Aerospace Workers president William Winpisinger, Edith Villastrigo, legislative director of Women Strike for Peace, Illinois State Representative Peggy Martin Smith and Connecticut State Representative Irving Stolberg. Every year since the mid 1960s the Indiana based Eugene V. Debs Foundation holds Eugene Debs Award Banquet in Terre Haute, to honor an approved social or labor activist. The 1980 honoree, was William Winpisinger. In 1983 Winpisinger co-authored(with radical labor journalist Jane Slaughter) "Concessions & How to Beat Them". Winpisinger was a memberof the Institute for Policy Studies 20th Anniversary Committee, which organized an April 5, 1983, reception at the National Building Museum, Washington DC attended by approximately 1,000 IPS staffers and former staff. In 1993 William Winpisinger was listed among former "Trustees" of the Institute for Policy Studies, Washington DC. At the 1987 National Rainbow convention in Raleigh North Carolina, a new board was elected, which included William Winpisinger. 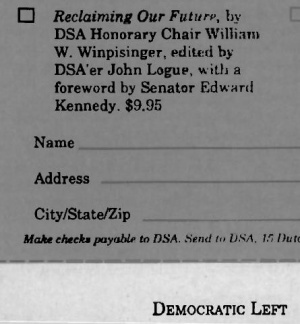 In 1991 Democratic Socialists of America was selling a book "Reclaiming our Future", by DSA honorary chair William Winpisinger, edited by "DSAer" John Logue and carrying a foreword by Senator Edward Kennedy. In 1994 William Winpisinger was an initiator of the International Peace for Cuba Appeal, an affiliate of the Workers World Party dominated International Action Center. In 1984 Democratic Socialists of America vice chairs were Harry Britt, Ron Dellums, Dorothy Healey, Irving Howe, Frances Moore Lappe, Manning Marable, Hilda Mason, Marjorie Phyfe, Christine Riddiough, Rosemary Ruether, Edwin Vargas Jr, William Winpisinger. William Winpisinger was presented with Chicago DSA's Thomas-Debs Award in May of 1989, a few months before he retired, at the 31st Annual Thomas - Debs Dinner. This page was last modified on 27 May 2018, at 18:03.